← Lisandro, your heart flourishes! Update, 25 October: Consulta results in unanimous rejection of mining and natural resource exploitation on indigenous territory. James Rodriguez has published a photo essay on his blog MiMundo (in Spanish, English version here). 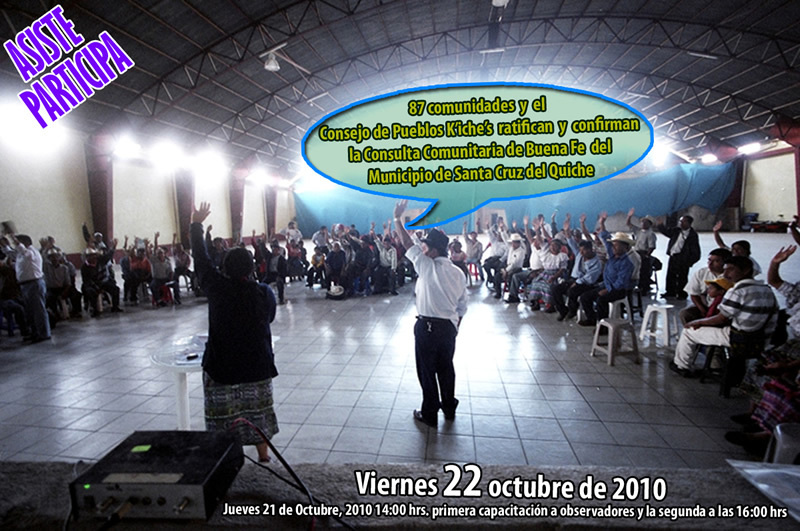 Tomorrow, Friday October 22, residents of the municipality of Santa Cruz del Quiché, department of Quiché, will participate in a community consultation (consulta comunitaria) regarding natural resource exploitation in their territories. The consultation process will be observed by local and international human rights and social movement organization, and will be streamed live online. Organized by the K’iche’ Peoples Council (Consejo de Pueblos K’iche’s), the consultation in Santa Cruz del Quiché is the latest of several that have been carried out nationally in recent weeks; another is planned for October 29 in the municipality of Uspantán, Quiché, regarding hydroelectric dam projects including the proposed Xalalá dam, which would potentially inundate and displace more than a dozen Maya Q’eqchi’ communities in the region. Based in the legal foundation of the International Labor Organization’s Convention Number 169 regarding the rights of indigenous and tribal peoples, the UN Convention on the Rights of Indigenous Peoples, Guatemala’s Municipal Code, and Maya customary law, dozens of municipalities have carried out similar processes in recent years. These processes, though they have been declared non-binding by the country’s Constitutional Court, fill an important legal vacuum within Guatemala, which has not implemented a legal process for consulting communities regarding natural resource exploitation in their territories. Earlier this year, the ILO recommended that the government of Guatemala cease issuing exploration or exploitation licenses for natural resource extraction due to the government’s failure to implement consultation processes (See the ILO Committee of Experts 2009 report, pages 679-680). The department of Quiché, which was the region most heavily impacted by the Guatemalan military’s genocidal scorched-earth campaign in the 1980s, is now the site of numerous resource extraction “mega-projects” including hydroelectric dams, mineral mining, oil extraction, a mega-highway, and biofuel mono-cropping. See below for a map of many of these projects, prepared by the local social movement Peoples’ Resistance (Resistencia de los Pueblos). Local communities and social organizations fear that these projects, which the require acquisition of vast extensions of territory by national and transnational corporations, represent a new wave of dispossession and displacement of indigenous communities. The experiences of indigenous and rural communities across Guatemala and the Americas have demonstrated that such projects bring not development but environmental destruction, criminalization of dissent, and social conflict to local communities. This entry was posted in News and Analysis and tagged community consultation, community referendum, consulta popular, dam resistance, Guatemala, human rights, indigenous resistance, Latin America, Maya, mining resistance, popular consultation, Quiché, Resistencia de los Pueblos, Santa Cruz del Quiché. Bookmark the permalink.